Being a business owner is hard. You have to constantly juggle all the responsibility of running your business while still providing the best quality of services or goods. Here at R.B.T Construction Roofing Division we get that. We’ve been providing commercial roofing services to Texarkana, Texas for over a decade now. Just like we pride ourselves on honesty, integrity, and always giving you quality where it matters. At R.B.T Construction Roofing Division we are passionate about one thing and one thing only, that’s commercial roofs. So when you’re looking for that hometown company that you know will do the job right the first time call the experts of R.B.T Construction Roofing Division today at 903-691-0931. As commercial property owners, you aren’t going to want the same type of roofing or service like everyone else. You have different needs and tastes, which is why its important to us that we offer an extensive selection of roofing services. We know it can be difficult to make this decision on your own; sure you might have an idea of what you want, but when it comes to the specifics, that’s where the professionals come in. Fortunately, the commercial roofers at R.B.T Construction Roofing Division are more than willing to go over our types of roofing systems with you and make helpful suggestions based on your criteria. Below are some of the commercial roofing services that we offer our clients in the Texarkana, TX area. Built Up Roofing BUR or built up roofing is one of the oldest and most reliable roofing systems out there today. EPDM Roofing By far one of the best roofing systems on the market today, an EPDM roof will provide you with years of service and can be installed quickly and hassle-free. Flat Roofing At R.B.T. Construction Roofing Division, our roofers are able to repair and install flat roofing on your commercial building. Metal Roofing Get over 50 years of protection for your commercial property by calling us for metal roofing services. Modified Bitumen Roofing This is a great option for those who are looking for an asphalt roof, but one that will hold up throughout the years. PVC Roofing With a PVC roof, you can prevent water from getting in your building and ruining everything you’ve worked so hard for. Roof Coating If you’re experiencing small leaks, or you’re just wanting to extend the life of your roof then getting your roof coated might just be the right option for you. Shingle Roofing Shingle roofing for your commercial building is great as it is versatile, durable, long-lasting, and comes in a wide range of shapes and colors. Storm Damage Roof Repair If there has been storm damage to your commercial roof, please contact us for storm damage roof repair service. 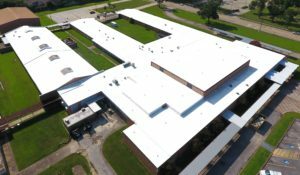 TPO Roofing TPO or Thermoplastic Olefin is a single ply plastic that can be stretched over your roof to provide a watertight seal protecting your building from the elements. If any of these roofing systems look like they could benefit your roof, please call our roofing contractors today! We are able to install, replace, and repair these types of roofs, so you can have a commercial roof that is sturdy, long-lasting, and provides you with the best protection. To get more information on our commercial roofing services in Texarkana, TX or to make an appointment with one of our roofers, please contact us at our office by calling 903-691-0931. Why chose R.B.T Construction Roofing Division? At R.B.T Construction Roofing Division we are passionate about commercial roofing and would love the opportunity to help you with your business. 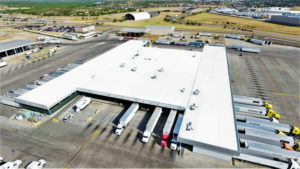 We’ve been providing the Ark-La-Tex with quality commercial roofing for over a decade. So the next time you’re looking for commercial roofing services in Texarkana, TX call the professionals you can trust at 903-691-0931. You can trust that when you work with our professional roofers, you are working with a team that will always go above and beyond for you. We guarantee 100% satisfaction every single time. Updated on February 1, 2019 at 4:03 pm by R.B.T. Construction Roofing Division.